The latest trend in driver design is producing clubs that reduce spin whilst increasing or maintaining launch angle. 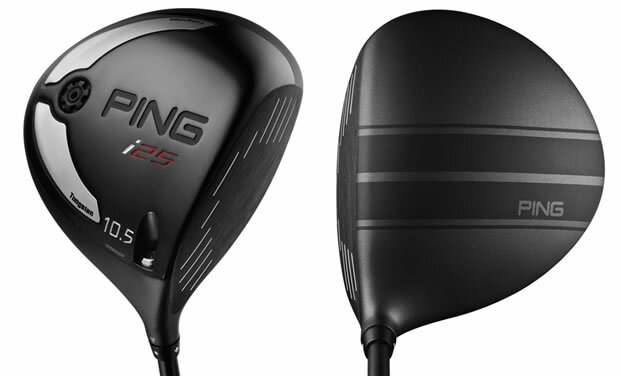 The latest addition to the low spinning market is the Ping i25 driver. The multi-material, adjustable, 460cc driver is geared to maximise distance and accuracy, thanks to a range of technologies, materials and some new looks. Much of the attention on the i25 will be focused on the look of the crown and Ping's new, patented racing stripes. Whilst the overall sole and crown colour remains very similar to the recent i20, Anser and G25 drivers from Ping, the company decided it was time to create a visual cue atop the clubhead that would improve alignment. Ping's research showed that the new racing-stripe graphics help players align the clubface both consciously and sub-consciously. The stripes match the width of a golf ball, and when placed behind a ball at address they help players align to their target as well as ensuring they take the driver bath on the proper path. Underneath the new crown graphics is a 460cc multi-material head with a variable-thickness face and tungsten sole weights. All the materials and construction techniques helped Ping create a faster driver that produces a flatter, lower spinning ball flight. Whilst the body of the i25 driver is made from a Ti 8-1-1 titanium, the face is made from a thinner Ti 6-4 material that is then varied in thickness inside the head to offer the maximum transfer of energy from the club to the ball. To get that low spinning performance that golfers are now looking for, Ping have added two high-density tungsten weights in the sole of the i25 driver. The weights help pull the centre of gravity inside the head lower, which reduces the spin the driver produces but also helps maximise roll-out. The weights are positioned on either side of the rear of the sole to help increase the club's MOI or resistance to twisting, helping improve forgiveness. And if all those technologies and materials are not enough for you, Ping will even let you adjust the i25 driver yourself. You might remember us telling you that Ping were very cautious about entering into the adjustable driver market, worried that the adjustable hosel may take away from the performance of the head. Finally with their Anser driver, they offered an adjustable hosel they believed worked, was easy-to-use and efficient. The lightweight, aerodynamic hosel is carefully designed to match the diameter and mass of Ping's traditional, non-adjustable, fixed hosels. Whilst it only offers plus or minus half a degree of loft change to either the 8.5, 9.5 or 10.5 degree clubheads, Ping believe the design does not sacrifice performance that is often lost with larger, bulkier hosels. Last but certainly not least, is the new range of shafts Ping offer with the i25 driver. Sometimes the shaft can seem like an afterthought when it comes to driver design, but with the new PWR range of shafts, Ping have placed a lot of emphasis on the performance of the i25 shaft to ensure it matches the characteristics of the clubhead. You would be forgiven for thinking PWR refers to power. In actual fact it is an abbreviation of Performance, Weighting and Responsiveness. Each of the three PWR 55, 65 and 75 gram shafts offer a unique weight, performance and stiffness profile designed to maintain a consistent swing-weight throughout the swing. A total of nine shafts are available, ranging in weight in stiffness, with the lighter options promoting a higher, draw-bias flight and the heavier options favouring a lower, fade-bias flight. Racing stripes and new shaft combine with low back CG for more forgiveness.